I’m writing to say I thoroughly enjoyed my experience renting a road bike from Velo Loco. Because I had planned a trip to visit friends who live in your area in the Pyrenees and wanted to be able to do some riding, I appreciated the flexibility of renting a bike, without having to be a part of a Tour group. Renting a bike enabled me to avoid the hassle (and expense) of bringing my own bike on the plane. I had some reservations about renting – you know, the classic stories about ill-fitting, poorly maintained “top-quality” rental bikes. However, when I arrived, my fears were quickly put to rest. Not only was the bike (titanium) ready to go when I got there, to my amazement it was brand new and perfectly tuned! And I especially appreciated the friendly, personal attention. I also have to mention that your location is simply stunning, and is one of the most incredible areas to ride I have ever seen. Thanks for helping to make my trip a memorable one! Velo loco was able to provide all the cycling and camping equipment I needed, and it was good quality too. I was able to set up my trip from the other side of the globe, all due to their quick and informative email replies. 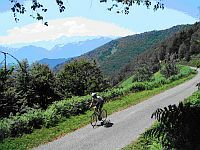 Overall, Veloloco make it so easy to come and enjoy the mecca of cycling that is the French Pyrenees. 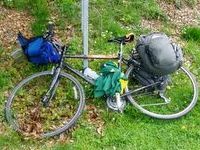 Cycling in the Pyrenees presents many different challenges to the cyclist with number one on my list being getting your bike there! It is possible to travel with your bike either by train or plane but it is a particularly trying, tiring experience. I have taken my bike on French trains twice, both successfully but if you are carrying luggage you also have to contend with carrying your bicycle which is now in a series of packages as the French TVGs do not allow a bicycle which is why you have to package it. There is a bus service from London and they have a bike trailer but it does mean you can not take advantage of the cheap flights and quick journey and you have to travel by bus to the south of France! With hiring a bicycle out there being the only sensible option I was ready to hire in Perpignan, with very little confidence as I do not speak French and I could not be sure of getting the right kind of bike for the mountains i.e. 3 chain rings on the front, pannier fixings plus you have a days cycling at least before you are in the mountains. Much to my surprise I happened upon the Veloloco web site and could not believe my luck that everything I needed to enjoy a cycling holiday in the Pyrenees could be hired at the start of the Col d’Agnes, a spectacular climb which featured in the 2004 Tour de France, right in the heart of the Pyrenees. 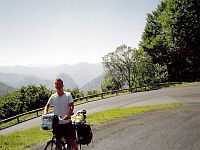 I called David Sewell who runs Veloloco along with his wife Samantha on the Thursday, sorted my flight and hotel in Toulouse on the Friday, flew out Monday and was cycling the Col de La Trappe on Tuesday Morning. On arrival at Aulus les Bains I was met by Sam who sorted me out with the bicycle, an excellent machine, she then took me to one of the local hotels which is excellent again and sorted out my accommodation for me, I was soon sitting down to a very good four course meal, I had perfectly good bicycle a nice room in the hotel and had only been in Aulus les Bains 45 minutes! I tend to book my holidays at the last minute due to work as I contract, so when in late October of 2006 a contract ended I decided to repeat the fantastic cycling experience I had had in the August and called Veloloco that I would be over the following Tuesday. Again I managed to get a cheap flight to Toulouse but in my rush to get out there I did not have time to book the hotel in Toulouse. When I arrived in Toulouse, disaster, there was an exposition on and there was not a hotel to be had within a 40k radius of the city. I called Dave at Veloloco. As I said before I do not speak French, plus I do not know Toulouse it is late at night and it is raining. Without Veloloco I was looking at a very uncomfortable night indeed, most probably out of doors and given the weather and the time of year, a wet and cold one too. Dave helped me out of this predicament for which I will be eternally grateful and arranged accommodation for me as close as he could to Toulouse. The next day I only had to take a short bus journey to St Giron and Dave came and picked me up. I can honestly say that if you decide to use the services of Veloloco, Dave and Sam will go out of their way to make sure everything is ok. Thanks again for providing a great riding experience. 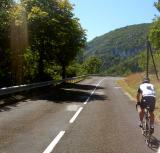 Prior to our arrival in Aulus-les-Bains, I was beginning to suffer some major cycling withdrawal. Sally brought her bike and was getting in some great riding and I figured my role would be strictly that of kid herder. Seeing all the cyclist on the road, the beautiful scenery and the harmony between those with motors and those without pushed me to give up my nanny job....for a bit at least. I appreciate your taking the time to set me up with a great bike on very little notice. You gave me some great advice that I know helped me go further than I would have gone. I can't wait to get back up the Col d'Agnes. We so enjoyed our trip to France last year that we're coming again in May/June of 2007. Bonjour, je voulais juste vous faire un petit signe afin de vous saluer et de vous remercier de cette superbe organisation vraiment sympathique!! Ben voilà l'été dernier au mois de jueillet avec des amis on avait comme projet de faire une balade vélo en france voir du pays ce depayser un peu de la martinique ce fut vraiment extra nous sommes partis de palmiers ou nous avons reçu nos vélos de routes très bien équipés pour arriver à lourdes vraiment un voyage inoubliable!! d'ailleurs je vous le conseil c'est super beau vue magnifiques nous étions logés un peu partout chez l'habitant dans des ^petis hotels des chambres...j'ai bénéficié d'une gourde véloloco un petit cadeau pour certains mais gros et pratique pour nous autre fan de vélo! !si un jour vous vouliez organiser un voyage en louant des vélos je vous conseil fortement de vus rendre au près de véloloco leur vélos de bonne qualité nous on offert la decouverte de bonne sensations! !amusez vous bien et restez prudent!! We had a great time. Was wonderful to be able to ride... It was great to have them dropped off and picked up. Had a brilliant holiday. Thanks very much for making the biking part of it so easy. We will definately be back, although we will probably do a few things slightly differently!! And we will be recommending you to our friends and family. Thanks so much again. Hopefully see you soon! - Thomas and Jenny, Ireland. Quite email to thank you and your company for organising such a great tandem holiday for us. It was a fantastic experience and one we plan to do again in the future. I'm passing the word around on what a great trip it can be and I wish you all the best for future business. Just a note to thank you for some fantastic cycling in the hills. Great bikes, good cycling, good weather. Thanks also for the advice on climbs, weather etc. as we got home I have found the map number 6 in Alison’s cycling top. I think it was an oversight as she does not usually nick things. Will send it back in the post this week. Again many thanks and hope to do it again. We had a great experience with Velo-Loco on our cycling trip in 2005. Set up over the internet was friendly and straightforward. The delivery of bikes and transport to our starting point was on time and well organized, the bikes and trailers and equipment were excellent, pick up at the end was also very efficient, and the cost of rentals was highly competitive with other providers in the area. All this and the delights of cycling in France. I would highly recommend your services to others and indeed have done so. Thank you again very much for delivering the bike to Argeles. I appreciate you going out of your way to get it to me. Being able to ride up Hautacam was an amazing experience for me. After driving in the area during the Tour, I fully understand and appreciate your efforts. We had a fantastic experience with our bike ride in the Pyrenees! Velo Loco set us up with nice and clean bicycles that worked perfectly. No, I mean perfectly! Everything was adjusted and oiled and we didn’t have a problem at all. The directions from David were clear and easy, and we felt very well taken care of. Our only regret was that we didn’t have time to ride more, I’ll always try to fit a ride with Velo Loco into my French travels!